I found this diaper motorcycle on Pinterest. You can go here for directions. As you can see in the picture, it is at www.sweetaprils.com. I wanted to make SURE you give credit where credit is due. Two of my friends are having grandchildren this fall. One is having a girl, the other is having a boy. While shopping at Kohl's, I always watch for their stuffed animals they sell for charity. They are quality and sell for only $5. I bought two monkeys. 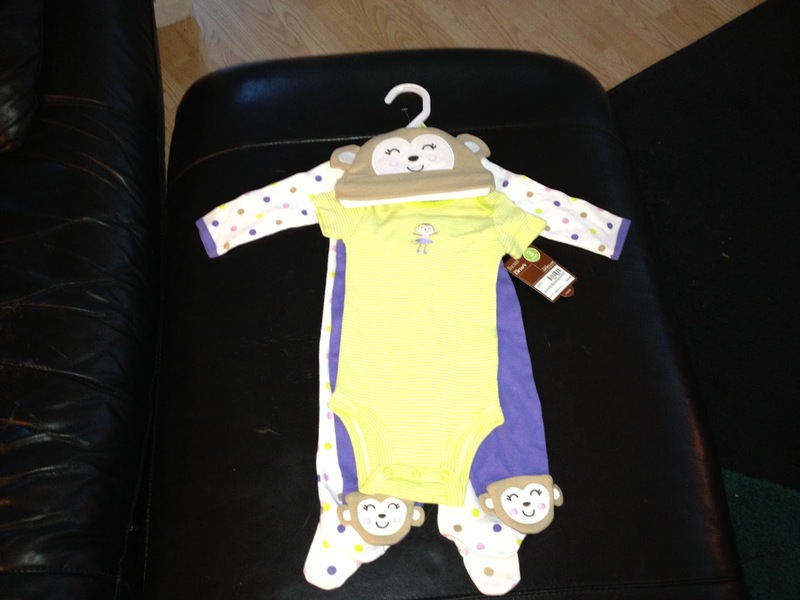 I also bought a girl baby's pajama set with monkeys on them. These clothes are for a newborn, so it was hard to get a detailed photo of them. 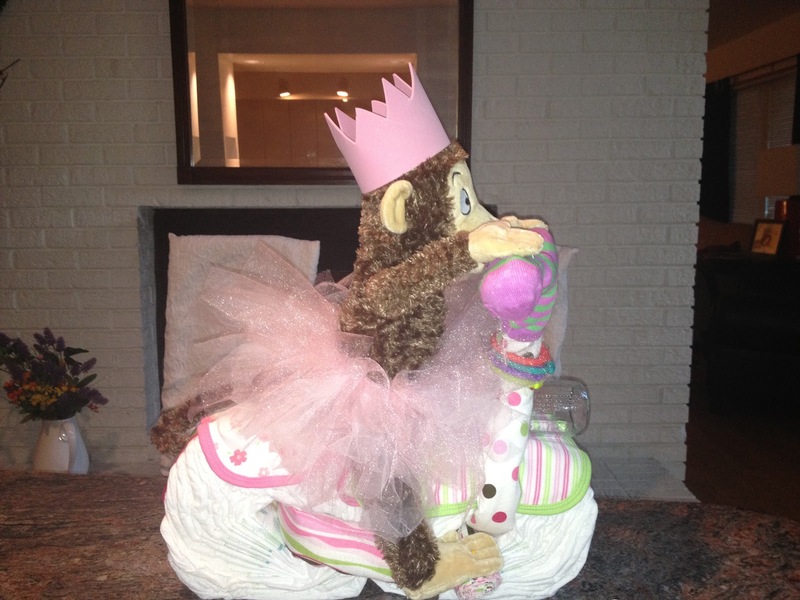 But, as you can see, there's even a monkey hat for the new arrival-to-be. 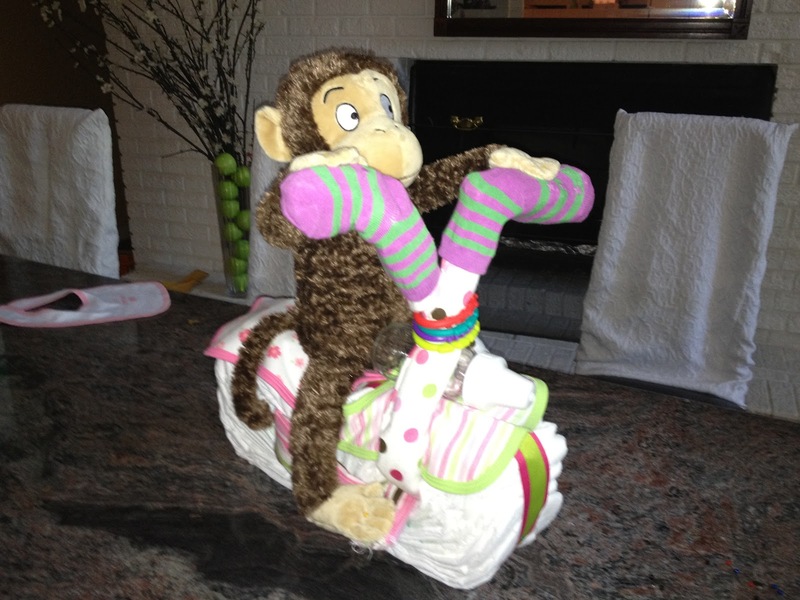 Her grandmother and i had fun at Target yesterday choosing the items to make the above motorcycle. I've compared prices with baby items at bigger box stores, and Target is where I buy my baby gifts. (I am not affiliated with them in any way). The cycle takes two receiving blankets and bibs. We are getting together today to make it. This post will be updated with the completed project. 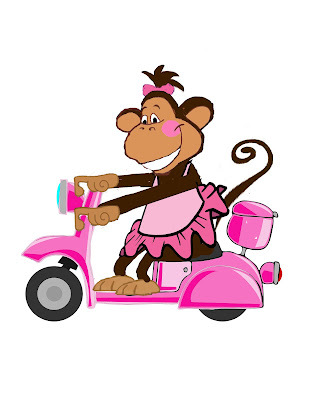 When I started planning the monkey theme, I started looking for clipart of monkeys. It was a long search, because I just wasn't satisfied with anything. I ended up fusing three monkeys together to get the one for the invitation. I put this monkey in a tutu because I found a book on Amazon.com entitled "Monkey Ballerina." Of course I ordered it, along with monkey napkins. We are packing a huge box to ship out west for the girl grandbaby. We decided to just serve desserts and drinks. Of course, one of the desserts will be cake pop rattles. I am updating this post. The monkey now has a pink tutu. I saw a tutorial on Pinterest and repinned it on my Baby Shower board. I am making two, so I bought 2 yards of white and 2 yards of pink tulle, along with 1/4" elastic. I tied the elastic around the monkey's waist. I cut 3" x 11" strips of tulle and folded them in half to make a loop. Then you just put it the loop behind the elastic and pull the two ends of tulle through the loop. Keep doing this around the elastic until it is as full as you want. The second picture was taken with a good camera, not my iphone. I needed favors, so I went to World Market and bought 12 large spice jars. I am making a powdered Mocka Coffee Creamer Mix to put in them. Can you guess where I got the recipe? I also bought two smaller, dark brown ceramic pots. My OTHER girlfriend's grandson's party is September 29. We saw this metal tubing that stretches and bends at an autoparts store. 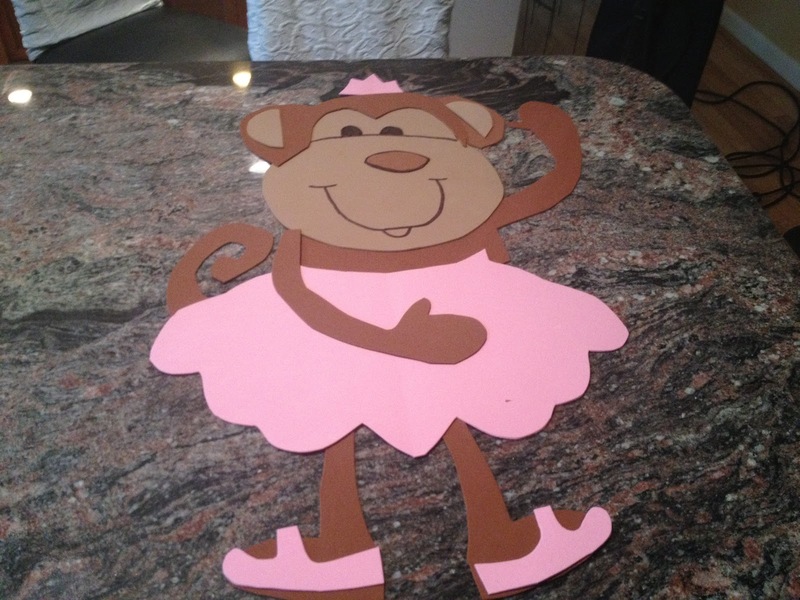 We are going to cut in in half to make table top palm trees for her future grandson's "Monkeys on Safari" baby shower. I am making a jeep diaper cake for that. I will buy regular green umbrellas for those trees for the leaves. First of monkey parties will have pink everything. The second monkey party will be greens and yellows. 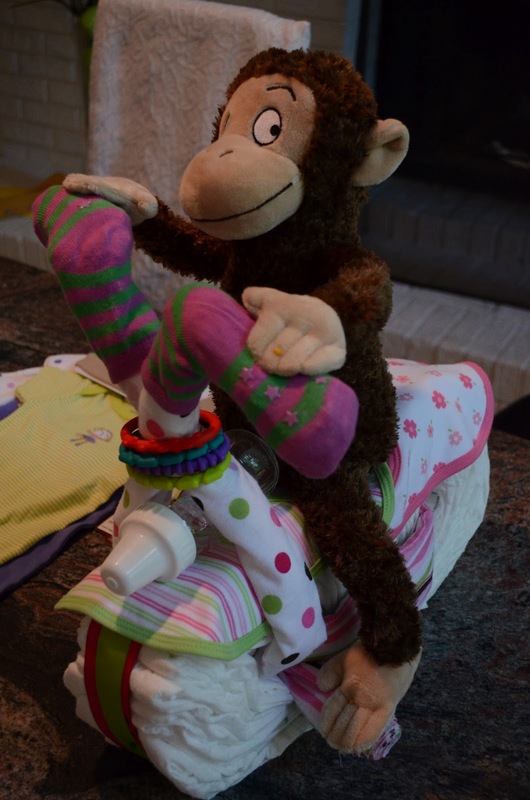 We went onto Kohl's web site and found more monkeys on SALE and ordered five more. They will hang on the umbrella leaves on the long table as the second party is a sit down luncheon. I purchased two muffin top pans this weekend. 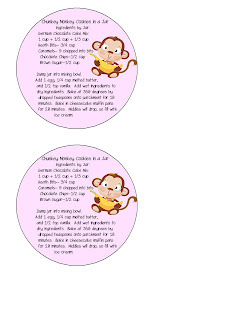 Those are to make chunky monkey cookies for that party. I needed to narrow down four games. I needed two games for each party. 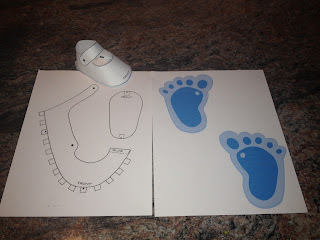 So...for the first party, we are going to make the baby shoes from the pattern on the left (see Pinterest). The guests are going to write advice on the bottom of each shoe. Then the contest is to see which team can make the shoes the fastest without any directions. The other game is for them to write down as many "baby talk" expressions that they can think of. For the second party, we are drawing nurseries on our heads, and matching specific candies to baby expressions. 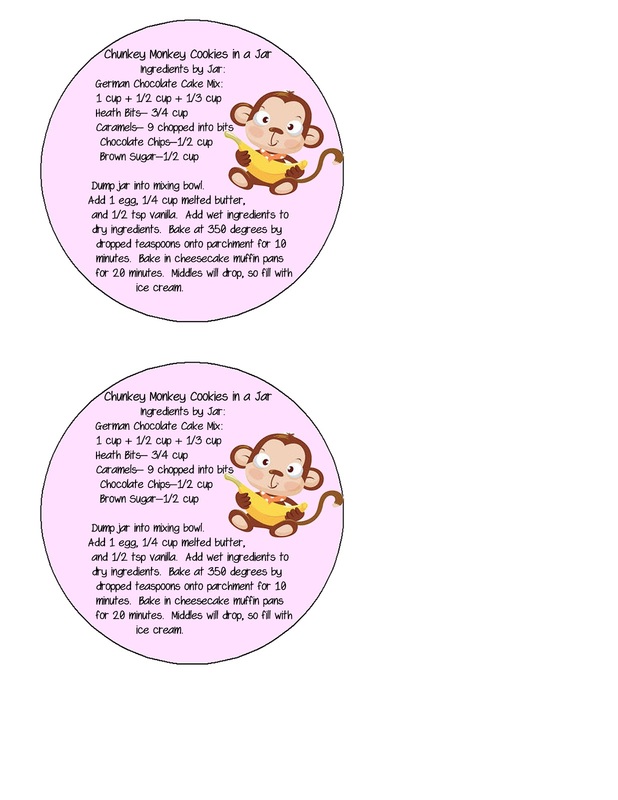 (see Baby Shower Pinboard).